Dragon Fruit Acquired | As I blog. I found them! For 6 months, I've been casually searching for them in grocery stores all over the Bay Area: Safeways, Whole Foods, Nob Hill, Trader Joes, small stories, big stores, hippie stores, artisan shops, farmers markets (didn't have much hope, but you never know), and even Chinese supermarkets. And all this time, it was waiting for me at the tiny Asian supermarket on Castro, a stone's throw away from my home. The appearance of the dragon fruit is something Andy Warhol would have conceived: hot pink, green, and horned on the outside with milky white flesh that's peppered with tiny black seeds. And this outrageous appearance is contradicted by its subtle, nay, sublime taste. It's entirely refreshing, rivaled only by the watermelon. If I had to describe it, I'd say it's something like a kiwi diluted to only a quarter of its original sweetness. 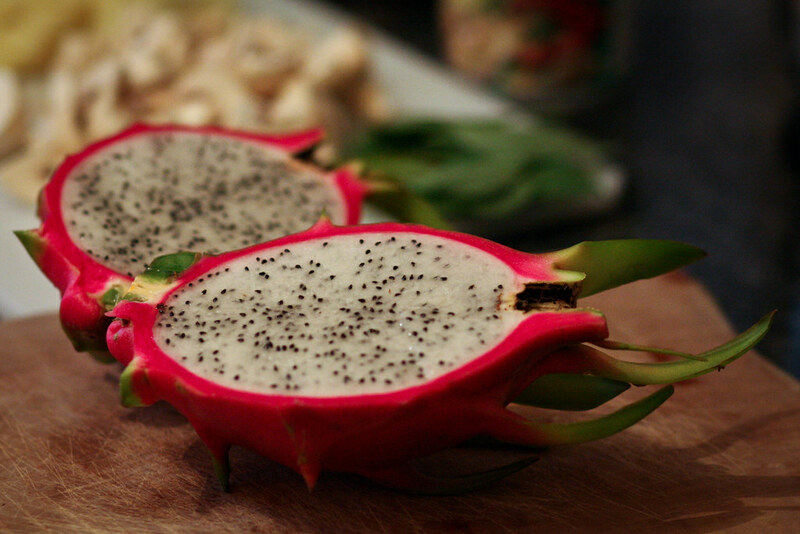 You can gorge on dragon fruit and still feel light. It's the perfect palette cleanser, and on top of all this, it's amazingly simple to clean (unlike one of my other favorite fruits, the mango). You just slice it in half, scoop out the flesh, and devour as desired. No deseeding, no pits, and most importantly, no urushiol on the skin (hello again, Mr. Mango). I first tried dragon fruit on my trip to China in 2009 and I've been a fan-girl every since. They're a bit pricey and I imagine not nearly as fresh and tasty as what I'd find in Asia or South America, but beggars can't be choosers, and I'm just excited I found a local dealer.